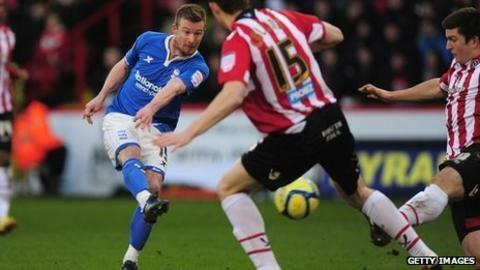 Adam Rooney scored twice as Birmingham sealed their passage to the FA Cup fifth round with a comfortable victory over Sheffield United. Highly rated 17-year-old Nathan Redmond fired in from the edge of the area following Jordon Mutch's corner. Adam Rooney doubled the lead before half-time from Chris Burke's cross. Although the Blades hit the woodwork, Wade Elliott sealed it from 20 yards when his shot was deflected in, with Rooney adding his second late on. Despite the eventual margin of victory, the hosts had started strongly with Ched Evans twice going close and they also threatened briefly after half-time. Yet once Redmond had put the visitors ahead, they never looked back. Rooney's first goal gave Birmingham breathing space although, after the restart, Lee Williamson hit the bar and Lowton's follow-up effort bounced back off the post. But the League One side's first defeat in nine home games was ensured when Elliott rifled home, with Rooney turning in David Murphy's cross to add the gloss. Chris Hughton's side, who are sixth in the Championship, have now gone nine games unbeaten. "It was a real good all-round performance. I'm as delighted with the clean-sheet and the performance as I am with the goals. "They were certainly a threat but then we got into our rhythm and the timing of our goals was important. "We're enjoying playing football and that breeds a certain amount of confidence." "The score line wasn't a 4-0, we appreciate that, but we are still out of the cup. "But we don't take too much disappointment from the performance, the result was that because they produced better clinical finishes in situations that they had better than we did when we had those situations and obviously that's the difference between the quality of the two teams. "If you look at the first three goals we are in the ascendancy. We're pushing the game and all of a sudden we've been hit by the sucker punch. "The first goal from the corner, it's a bit of quick thinking from their point of view and slow thinking from ours, but prior to that corner we're pushing very hard to get that first goal and that would have made the big difference, as it did."